The wonderful complexity of this server is exemplary of Butler's sculptural skills. The piece is a complex assembly of marine motifs, a chain of animal eating animal. 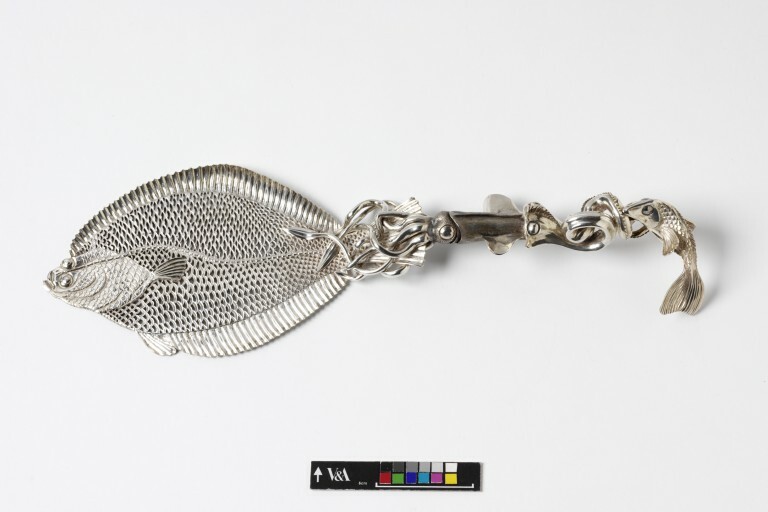 The blade is a realistic flounder, intricately pierced to create the scales in negative and raised at the side for practical purposes. The solidity of the cast animals that comprise the handle beautifully offset the piercing of the blade and recall Rococo silversmiths in their styling. The server is both beautifully decorative and functional, the piercing of the blade serving to counter the weight of the cast handle. The sever is a modelled, cast and chased assemblage of marine motifs. The blade is a realistic depiction of a flounder that is pierced over the whole body - apart from ruffled fins and head - to form the scales in negative. The handle is a complex piece of casting: a squid holds the tail of the flounder in its tentacles, and in itself is being attacked by a voracious eel whose body is nibbled by a realistic fish with highly oxidized brown eyes. The central part of the flounder's body is ten to twelve gauge (2.5 mm) and comes down to twenty gauge (0.8 mm) on fins and head which act as serving edges. 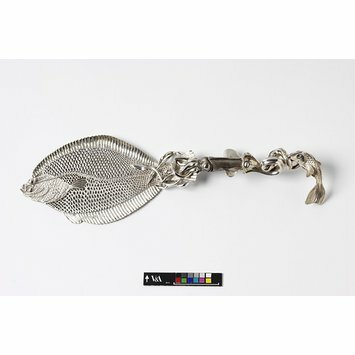 Historical significance: In this piece the artist was "able to combine four distinct silversmithing disciplines: modelling, forging, chasing and piercing." Butler's aim was to reconcile functionality with grace.